The authors of the Garrow Report and others have recommended that Memphis nominate the Cobblestone Landing for designation as a National Historic Landmark (NHL). What does that mean? The benefits of a National Historic Landmark include enhanced prestige and tourism, and special access to Federal grants. This district is recognized for its importance in the development and influence of the "blues," a unique Black contribution to American music. This popular musical style was born on a Beale Street lined with saloons, gambling halls, and theaters. William Christopher Handy (1878-1958), a preeminent figure in the establishment of composed blues, wrote "Memphis Blues" here. Deterioration, neglect of maintenance, and incompatible usage are threatening the landmark district. The city of Memphis should enforce maintenance of the historic buildings in the district by lease holders. The Tennessee State Historic Preservation Office has recommended an assessment of remaining cultural resources within the district. Click the "Continues..." link below to see the text of my additional comments, submitted by email today to the U.S. Army Corps. My original statement is at this link. 1. The RDC's "Historic Cobblestone Landing Restoration and Walkway Project" (the Plan) is fatally flawed and must go back to the drawing boards, for the following reasons, among others. 2. 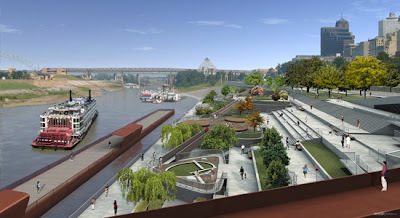 Regardless of how they titled it, this Plan (by RDC's own statements) is clearly intended just to preserve the cobblestone-covered areas, not to preserve the historic Cobblestone Landing, which is today an active public wharf and landing for riverboat cruises. 3. When the RDC claims the Plan offers "improved boat docking," that is a misleading statement by the standards of ordinary English. They mean "to dock" only in the incomplete sense of "to park" -- not for the loading and unloading of passengers and baggage. 4. 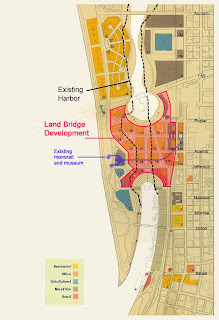 The Plan is directly contrary to the Riverfront Master Plan agreed to by City Council in 2002. It is questionable whether the RDC even has the authority to propose this Plan, much less to carry it out. 5. Rip-rap is for erosion control, not for boat landings. Any boater can tell you that. The use of rip-rap in this plan is compelling if not prima facie evidence that the RDC intends to de-commission an active boat landing. 6. The north-south walkway is inauthentic and obstructs the Cobblestone Landing's use as a boat landing. 7. The RDC told City Council over a year ago they planned for the Memphis Queen Lines to board and de-board passengers at the (to-be-built) Beale Street Landing, but because of the Queen II's historic status they would probably have to let it dock (park) at the Cobblestones in between boarding times. I can produce an audio record and transcript of those statements. 8. I question whether Federal transportation money can lawfully be used to shut down an active transportation facility, as is clearly the RDC's intention. 9. Because RDC is a private company, not a government entity, it should always be compelled to testify under oath and penalty of law. It is not sufficient for the public to listen to marketing promises while viewing PowerPoint presentations. 10. In 2007, TDOT allowed Beale Street Landing (BSL) to be approved over the strenuous objections of historic preservation specialists, such as TN-SHPO, following the questionable theory that BSL only impacted a small portion of the Cobblestone Landing where the two overlapped. If TDOT allows this Plan to decommission the Cobblestone Landing to go forward, it would amount to enshrining its own 2007 mistake, and would cause irreparable harm to Memphis historic preservation. RDC bombshell: Misunderstanding — or bad faith? On August 11 at the public Cobblestone Landing meeting, the Riverfront Development Corporation (RDC) left a quietly-ticking time bomb. In their meeting handouts was a revelation that was so stunning that they had sat on the news for seventeen months. Even now, they had buried it on page 27 — the very last page. This week, Memphis historic preservationists are coming to the realization that the RDC, it seems, had tried to usurp them all. The company had ignored the expert advice of the City’s consultants, and was even preparing to renege on a promise to City Council. In their own words, the RDC had "decided not to pursue designation" of the Cobblestone Landing as a National Historic Landmark. Their justification? The State Historic Preservation Office (SHPO) staff had told them it wasn’t eligible, said the RDC. But SHPO tells a somewhat different story about that meeting. August 11 attendees were given close to 40 pages of handouts when they arrived, and the meeting began promptly. Even if they had tried to read them while Mr. Lendermon and others gave presentations, no one in the audience would have gotten to page 27 that night. Was SHPO giving RDC an advanced determination of the Cobblestones’ eligibility for listing? And if so, on what basis? They would apparently be contradicting the City-sponsored study in 1996 that had recommended pursuing Landmark status. What had changed? Had the SHPO staff actually even said what the RDC now claims? Not really — if you ask them. I contacted the Tennessee State Historic Preservation Officer (TN-SHPO) myself. He replied with this statement. Everybody in the business knows that the nomination process is lengthy and difficult, and not guaranteed to be successful, so that’s not really big news. Furthermore, this wasn’t the proper forum to obtain such a determination. The nominating process starts and ends with the National Park Service. Tennessee’s SHPO staff would, in due course, be asked their opinion about the nomination, and there's no doubt their opinion would be very influential. Would SHPO be privately telling the RDC, before anyone had officially asked, that their opinion at some future point would be negative? I don’t think so. It would be improper. Could this all be a big misunderstanding on RDC’s part? After all, they don’t have a perfect track record when it comes to understanding history. Possibly a misunderstanding — but I think you also have to consider the background and context that might have influenced their thinking. But that’s only the glass-half-empty version of the story. There is another version from the experts. 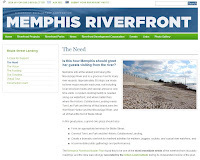 The city-funded 1996 Garrow & Associates Memphis Landing Cultural Resources Assessment and Preservation Plan (the "Garrow Report," downloadable here) stated that the Memphis Landing — aka the Cobblestone Landing — is the best preserved of all the 19th century landings in the Mississippi River drainage basin. Unlike landings in other major cities, our Cobblestone Landing remains largely intact in its historic dimensions and physical composition. Later changes have not severed its contact with the city that it continues to serve to the present time. Every day, season permitting, Memphians and tourists use the Landing to board a riverboat for scenic cruise on the Mississippi. Four nights a week, there is a dinner cruise. Private boats also use the landing. 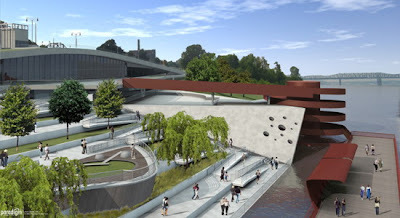 On a national level, the Memphis Landing may best represent the significant national themes of 19th century river commerce and westward migration. As there are no resources listed as National Historic Landmarks (NHL) Garrow recommended that the nomination of the Cobblestone Landing as a National Historic Landmark be pursued. In addition, the Garrow Plan prescribed treatments that would minimize adverse effects that currently exist on the site or that may be imposed or proposed in the future. Since that time it has been an accepted truth in the Memphis historic preservation community that the Cobblestone Landing would be restored in a sensitive manner and nominated for listing on the register of National Historic Landmarks by the City. When the RDC took over the riverfront in 2000, the job of restoring the Cobblestones fell to them. But preservation wasn’t their biggest priority — they wanted to get busy building things. First they had to produce a Riverfront Master Plan. 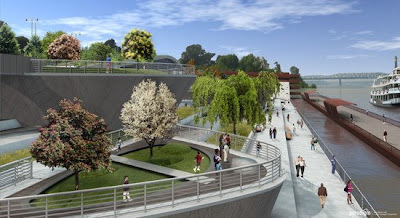 Then they immediately started on a plan for Beale Street Landing, then developed a Promenade Plan. So many millions of square feet to develop, so little time. Seven years later: If there was a Cobblestones plan it hadn’t been seen by anybody outside the RDC. Ten months later — having just locked in the last BSL approvals they needed — the RDC showed their plans and objectives to SHPO. Apparently a listing on the National Historic Register wasn’t one of them. Neither was the floating walkway. In their design, they wanted to split the cobblestones in half lengthwise with a sidewalk/retaining wall (underwater half the year). They wanted to fill in the waterside half of the landing with rip-rap — a cheap material that's used for erosion control but not for boat landings. Half a plan — at half the cost? Presumably they had estimates that this design would fit within the budget they already had in the bank, so to speak — about $5.5 million of Federal money and another million or so from the City. By then, the RDC must also have had an inkling that any plan to restore the Landing properly (without the rip-rap) might cost several million more. It would require them either to raise more Federal money, or to go to the City Council for a larger budget for the Cobblestones project. And that could endanger the budget they were counting on to finish Beale Street Landing — most of the balance of which, though budgeted, still has to be appropriated by the City Council. If they already knew all of this by the end of 2007, they probably saw it as a Hobson’s choice: Finish Beale Street Landing, as designed, with all those “islands” — or put it at risk by restoring the Cobblestones properly. In that context, with that mindset, you might almost understand how they could be told one thing but hear something else. Thus, it was decided not to pursue such a designation. "It was decided" by a private company whose middle name is “Development,” who quietly took it upon itself to make such a momentous choice on behalf of all Memphis, and then said nothing about it, even to stakeholders, for seventeen months. For a little change of pace, I’m going to offer something positive. I am going to present a solution: A five-point plan to fix the riverfront problems, making the best of what we already have, and having a good shot at something we can enjoy and be proud of in the future. More good news: We might be able to pay for it within the amount we’ve already budgeted. My plan consists of five simple principles. I can’t give you drawings because I’m not a designer. But I think you can get the general picture from these five principles. I’m a great believer in working from principles and objectives. I know the importance of getting them right from the start, and then abiding by them. 1. Re-adopt the objectives and priorities of the Master Plan. It shouldn’t have been necessary to say that. The above words are quoted directly from the 2002 Riverfront Master Plan, as approved by City Council, and presumably still in effect. The Master Plan also defined quite clearly the proper relationship of Beale Street Landing (BSL) to our historic landmark: as an adjunct, not a replacement. 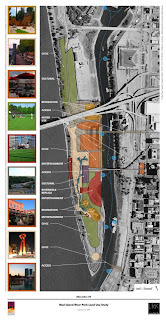 But the Riverfront Development Corporation (RDC) chose to ignore the Master Plan, before the ink was hardly dry, and steered the projects their own way. This time, the project's goals will need to be explicitly stated and explicitly agreed to. Otherwise, let the RDC itself go their own way, and let someone else take charge. 2. Redesign BSL and Cobblestone areas together, as one Great Memphis Landing. Let's face reality: To accomplish these goals, both the Beale Street Landing and the Cobblestone Landing plans will require re-thinking and a fresh design. This time, however, let there be single, unified plan for a restored Great Memphis Landing, with historic and more modern (Beale Street Landing) areas. Yes, we can re-design BSL, and now is the opportune moment. We might still be stuck with the red steel boat dock and helical ramp. But the “islands”, terraces, restaurant, gift shop, terminal, and parking lot have not yet been started, and depend on yet-to-be-appropriated City funding. They should all be on the table for re-consideration in the new design. This time, we should use local designers. We are not lacking for professional talent and vision here in Memphis. Our problem is that we tie their hands with wrong-headed, misguided requirements. 3. We must rebuild the lower portion of the Cobblestone Landing properly. As Benny Lendermon said in the August 11 public meeting, almost nobody objects to the repair and restoration of the Cobblestones themselves. But there is a huge difference between standing around looking at some old cobblestones, and actually using a historic Cobblestone Landing to board a riverboat for a cruise on the Mississippi, or to launch your own canoe. The real objective should be to restore the Cobblestone Landing, hopefully for another 150 years of continuous use. That will entail rebuilding the lower portion with concrete and other materials – not cheap rip-rap – and the use of a coffer dam at an (alleged) $5 million of extra cost. So be it – and here's how to get the money. 4. Remove those “islands” from the design, and recoup $5M. The terraces might well remain in the new design, but those awful “islands”? They. Must. Go. However you feel about them, the islands (or “pods” as they've been called) are the biggest part of the problem with the original Beale Street Landing design. They dominate the view, distort the riverscape, and overpower the historic Cobblestone Landing – while bearing no relationship whatsoever to the Memphis riverfront and its history. By getting rid of them, we might also save the $5 million needed to restore the Cobblestone Landing properly. Furthermore, we might avoid some significant security problems. Looking at the drawings gives me nightmares of falling children. One can see opportunities for late-night muggers and errant skateboarders. Do we need to bring those problems on ourselves? 5. Consider treating MIRP and its riverboat landing as resources and perhaps part of an integrated solution. When BSL planning started in 2002, it was thought that Mud Island River Park (MIRP) and its own boat landing would eventually be gone, covered over by a land bridge, and that BSL was to be its replacement. That land bridge has since been aborted from the Master Plan. 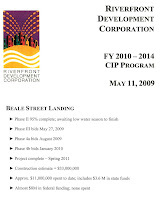 Even though we knew in 2006 that it was no longer needed, the City stood passively by and allowed the RDC to redouble its efforts to get the $30 million Beale Street Landing built. RDC needed its big project to justify its continued existence. Therefore, with this opportunity for a do-over, it makes sense that we now consider Mud Island River Park to be part of the resources we have to work with. Indeed, perhaps the current planning process for the future of MIRP should be suspended if necessary to dovetail with the Great Memphis Landing design. 1. Submit a comment on the Cobblestone Landing proposal (click here for PDF form). Make a point of telling the Army Corps of Engineers and TDOT that you want it to continue as a fully-functioning riverboat landing. Therefore, the lower part of the landing must be rebuilt properly, not filled in with cheap rip-rap. The Landing must not be broken in two by a retaining wall and pointless underwater sidewalk. Get your comments postmarked by September 1 for them to be considered. Note: Mitch Elcan of the Army Corps has told Friends for Our Riverfront that he will also accept emailed comments for the record. When you write him, I'd appreciate getting a copy, too. The period for public comments is closed. 2. Contact your City Council person. Ask them to sponsor a resolution adopting the above five principles, and denying further funding until both projects are redesigned according to those principles. 3. Ask the Mayoral candidates what they intend to do about our 10-year riverfront fiasco. If they express strong support for the status quo (the RDC), it tells you something about who their friends really are, and how independent they'd really be if elected Mayor. 4. Forward this link to your friends. Recommend they read the other articles on this site. The best of the articles are linked in the sidebar under Important Questions. 5. Do you know any of these people? Ask them why they sit idly by and allow the RDC to decommission our historic Cobblestone Landing after 150 years of continuous use. Ask them why they think it's so much more important to have this instead. Birds-eye view of main and second pods, at Riverside and Beale. A game of Putt-Putt golf, anyone? Main pod is above and behind your left shoulder. You're looking south. Do you see any security risks? Near the top of the helical ramp, looking north. Hanging Gardens of Babylon? The helical ramp, as if seen from a big riverboat. Does the word "cheesy" come to mind? 5. The plain fact, as RDC critic and the riverfront's institutional memory Michael Cromer and others have noted, is that "development" is the RDC's middle name. 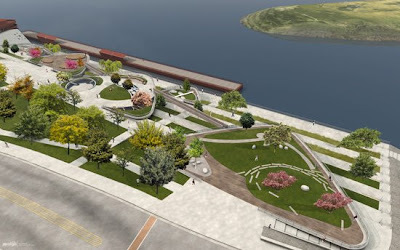 Without a big project, there is little need for a quasi-public agency to beautify and maintain the riverfront parks and build a roundabout on Mud Island. The RDC's original big table had four legs: founder Kristi Jernigan, the master plan featuring the aborted land bridge, Beale Street Landing, and Mayor Willie Herenton and his buddies. Three of those are gone. But thanks to Beale Street Landing and the cobblestones, the RDC can probably hang on for a few more years. The audio and main handout from last night's meeting can be found at this earlier post. My initial thoughts? I think there were four main things I took away from the meeting. 2. The bullet that suggests the plan will "Continuation of and improvements to the docking of boats?" 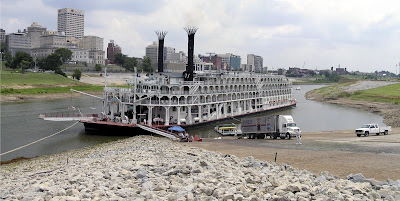 Mr. Lendermon and Captain Lozier confirmed that the word "docking" should be parsed in a very narrow sense: Parking of the Memphis Queen Lines riverboats when they are not in use. They will board and unload at Beale Street Landing. 3. Mr. Lendermon confirmed that the two acres of cobblestones that the City carted away in 1994 haven't really been lost. They are stored on a City dump somewhere and will be brought back when their time comes. The first three points were not the biggest news to me. But the fourth item was a great revelation. As a "take-away," it took my breath away. It turns out that the RDC considered and dismissed the alternative of doing the job right. Restoring the lower part of the Landing with anything other than rip-rap would require building a coffer dam to dry the area out. That would cost an additional $5 million. Whereas, rip-rap can be applied "wet" (i.e., dumped into the water) and is itself much cheaper than concrete or other materials. That $5 million savings could go into, say, building bustier-like "islands" for Beale Street Landing, which is a bigger priority since those islands will no doubt attract so many tourists to the City. Artist's conception of the tourist magnets. 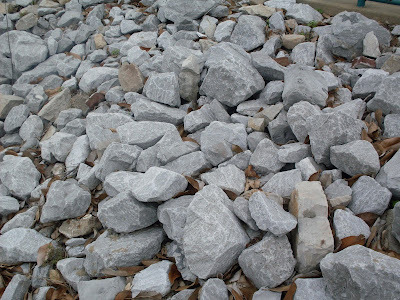 Memphis Flyer: Cobblestone Concerns: Opponents object to walkways and boulders in riverfront plan. If you weren't able to attend Tuesday night's public meeting about the Cobblestone Landing, I've posted links below for you to listen to the audio and obtain some of the handouts. Update: A warm welcome to visitors sent here from Memphis Heritage! Before you leave, please also see A new plan for our Great Memphis Landing, and do click on some of the Important Questions in the sidebar to your right. Note that the document doesn't bear the logos or names of Tetra Tech (environmental engineers), Ritchie Smith Associates (urban landscape architects), or Clark Dixon Associates (architects), who have all been consultants to RDC on this project. If it had borne their "signatures", then you could be sure that those consultants would have reviewed this document before release. Since their names do not appear, the document would seem to have been written internally by RDC, and may or may not be completely accurate. As we have already seen, the RDC's marketing department doesn't always read consultant reports with as much thoroughness as might be deserved. Indeed, the same historical mistake (cobblestones as ballast) reappeared on page 2 of this handout -- until someone at the RDC noticed my mention of it here, and edited the document. It is the first time the general public has seen this level of detailed information. Other versions of the material have been circulating among the "stakeholders" for about 18 months, but haven't been on the RDC Web site or in the public's hands, until the people walked in the door of the meeting last night. So you can imagine that the public audience was already well-briefed and fully-prepared to discuss and debate the details of the Plan. Not. One thing you will not find in the handout document is any discussion of the alternatives. By law and regulation, however, the permitting process does require the applicant to expose and discuss the alternatives. If you want to know about the alternatives, you'll have to listen to the audio below. They're mentioned in passing near the end of Part 3. I recorded the entire meeting from my seat in the audience. Because the meeting was so long (almost two hours), I have broken the MP3 down into seven more convenient, logical sections. There are still (as of 8/20) 11 days remaining in the comment period. If you get your comments postmarked by September 1, they will be included in the official transcript, and presumably considered by the regulators before issuing permits. I've scanned their official, pre-addressed comment form and made it into a PDF, which you can download at this link. Rip-rap (aka riprap) is used for erosion control, not boat landings. It is a layer of jagged rubble that absorbs and deflects the waves that would otherwise wear down the shoreline. It is not used for boat landings. Any boater will tell you that you land on rip-rap at your own risk. Rip-rap can even sink barges, as happened in a recent incident at Tom Lee Park (below). "Access for whom?" is a question that likely came up at the public meeting. 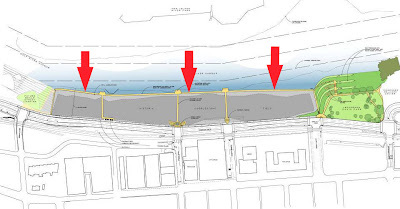 Recreational boaters would like to land their canoes and kayaks at the cobblestones, but fear they will be excluded from them and Beale Street Landing. Expect to hear a lot about riprap in the coming days. One recent boating event did not go well. The powerboat regatta hosted by the RDC July 31st through August 2nd was plagued by bad weather and spotty marketing. There was also the matter of a barge, owned by the Memphis Yacht Club and used for parties and Memphis in May activities. A spokesman for the club says the RDC borrowed a blacktop barge, approximately 30 feet by 12 feet, for the powerboat people to use as a platform to take pictures and movies. It was moved to the south tip of Mud Island, a muddy sandbar suitable for landing a barge. But for some reason, possibly to get a better vantage point, the barge was moved by a police boat to the other side of the harbor, along the riprap and cobblestones. There it sat, until wave action pushed it over some sharp rocks. The barge sprang a leak and sank. No one was aboard. As of Monday afternoon, it was still at the bottom of the harbor. The yacht club is trying to work out responsibility for salvaging it with the RDC, the powerboat people, and the police department. "There are so many hands in this darn thing that it's hard to figure out responsibility," said the yacht club spokesman. "All we know is that it wasn't us. We know how not to sink our barge. We're probably talking $5,000 to float and fix the thing." What rip-rap looks like. Not healthy for boats. In 1994, the City was caught, red-handed, carting away over two acres of Cobblestones from the exact location that will soon be covered up by Beale Street Landing. By a Memorandum of Agreement, the City was forced to bring in archeologists and historians to study the situation, make an assessment, and give recommendations—lest there be any further carnage to our history. Today, of all the great river landings on the Ohio, Missouri, and upper Mississippi rivers, the Memphis Landing is acknowledged to be the best preserved of these important commercial places. Perceptively, these historians also noted that, from the 1930s on, "the City of Memphis saw the Landing as a nuisance rather than an asset." Those writers had hoped that their study would mark a change in the City's attitude, and a newfound respect for the greatest cultural landmark in this City. Unfortunately that would not be the case, and so, here we stand today. This is not an issue of preservation, per se. The City knows that it must preserve what remains of the Cobblestones, because they are a protected landmark and part of the Cotton Row Historic District. Nuisance or not, the City must finally live up to promises it has made for decades. It is really an issue about preserving an historic, functioning riverboat landing, one which is still in use to this very day. That is what makes our Cobblestones different from similar cobblestones around the world. It has been over 150 years since the first Cobblestones were laid. They've seen much wear and tear as thousands of riverboats have come to the Landing to load and unload both people and cargo. The City has done precious little in recent years to protect and preserve them. 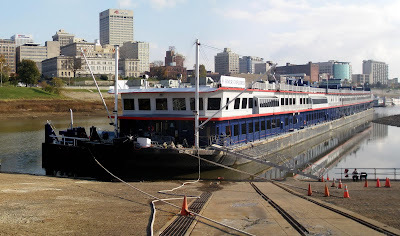 But in spite of that neglect, the Cobblestone Landing still remains in use by Memphians and visitors as they embark on cruises up and down the Mississippi. To save the Cobblestones, they say we must build a sheetpile bulkhead retaining wall, and fill the lower area with rip-rap. Simple common sense tells you that retaining walls, sidewalks, and rip-rap will destroy its ability to continue as a functioning riverboat landing. But it is pointless to argue those points, because they are based on a faulty assumption. What is really wrong with this plan is that it has the wrong objective to begin with. This plan aims only to preserve the Cobblestones as if they were a museum relic—"cobbles under glass" if you will—something to be seen but not to be used. So long as that remains the plan's objective, then the City can hire a parade of consultants and experts to tell you all about the benefits of sheetpile bulkheads, retaining walls, and rip-rap. If those words aren't clear enough, I can quote more passages from that same Master Plan. They would leave no doubt in your mind about the importance of preserving the Cobblestone Landing as a boat landing. Importance seen, that is, by all but the City and their contractors, the RDC. Some of us warned TDOT and SHPO about this two years ago, when the plan for Beale Street Landing was still under review. We said that you cannot properly consider the historical impact of the Beale Street Landing design without also having a Cobblestone Landing plan before you. But TDOT and SHPO chose to consider Beale Street Landing by itself, and to consider the Cobblestone area only at the margins. And so here we are today. The City wants to shut the Landing down in favor of their new boat dock at Beale Street. "Who could have predicted?" I ask, sarcastically. TDOT and SHPO must insist that the RDC explicitly re-adopt the goals and objectives that were stated in their own 2002 Riverfront Master Plan, and that were approved by the Memphis City Council in 2002. Then they, the RDC, must go back to the drawing boards. They must consult their experts again, giving them the correct objective, not the faulty one. With the correct objective in mind, any competent expert will tell them exactly what they need to do. In all probability, much of the plan will remain unchanged. But I can assure you with confidence that that the rip-rap and the sheetpile bulkhead retaining wall will magically disappear from the plan. The Riverfront Development Corporation, on behalf of the City of Memphis, and in coordination with the Tennessee Department of Transportation, will conduct a Public Meeting that will be held on August 11, 2009 from 5:30 PM to 7:30 PM at The Balinese Ballroom, 330 N. Main Street, Memphis, TN 38103. The City of Memphis is proposing to construct the Cobblestone Landing and improvements project, located in Memphis, Shelby County, TN. The project is being constructed to stabilize the lower edge of the cobblestones, restore the cobblestone field, and provide improved accessibility to the Cobblestone Landing. Persons having a disability that will require assistance to participate at the Public Meeting may contact Ms. Brenda Adair at (901) 312-9190, Fax (901) 312-9189, or by e-mail at Brenda@memphisriverfron.com, ten (10) days prior to the date of the meeting. Comment sheets will be available for attendees to submit written statements. A court reporter will also be available to receive oral statements to be included in the official project transcript. Written statements and other exhibits in place of, or in addition to these, to be included in the project transcript may be submitted within twenty-one (21) days after the meeting date to the address of Mr. John Conroy, P.E. [at Riverfront Development Corporation] stated above.